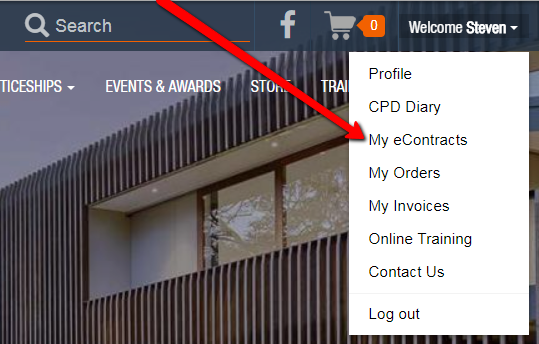 Click the drop down menu next to your profile name (top right hand corner of the website) and click My eContracts. Please note you must be logged in to access eContracts. eContracts is free to use and available exclusively to Master Builder members. Currently available are eight of our most popular contracts including the Residential Building (BC4), the Cost PlusResidential , the Commercial Building BC3 and the Residential Renovations and Additions. Log in, take a look around the system and start a new contract. When you have completed a contract, simply buy it by clicking on the 'BUY' button. The ‘draft’ watermark will be removed and the contract will now exist in your ‘Bought Contracts' page. Changes can still be made to the contract but certain fields will remain locked with no option to edit them. They include Owner's name, Builder's details and site address. Complete online access to create, edit and manage your contracts. Range of contracts available including Master Builders commercial and residential contracts and subcontracts. Email functionality to send clients, subcontractors and colleagues a link to view contracts online. Clone action to copy your contracts and edit the necessary content whenever you need a contract similar to one you’ve already completed. Cheaper pricing scheme reduced prices per contract - cheaper then buying hardcopy and you don't need to buy multiple copies. Print as many as you need. 4. The selected contract will now open for you to start filling out. 5. To move forward or backwards in a contract, select the Next or Back buttons. Alternatively, use the side bar navigation links on the right hand side of the screen. 6. At any time you can Save or return to “My eContracts” and any data entered will be saved. You must have a client name and site address entered before a contract can be saved. 7. At the top right of the screen click Save to save entered data or Save & go to My eContracts to save your contract and return to “My eContracts”.